We always hear- I can’t make cards because I am not creative. Here’s our answer to that. Use the simply sent card kits to creat cards in a snap. The Simply sent Great Day card kit comes with all the accents, embellishments and even envelopes to make 8 cards. 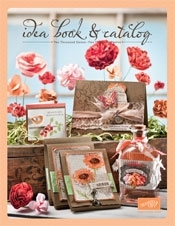 The simply sent card kit #122375 is on pg 192 of the Stampin Up 2011-2012 catalog http://204.228.150.61/catalogs/20110701/20110701_IBC_en-US.pdf for $12.95. That is a real bargain 8 cards for $12.95. Use the kit as is and create simple cards or combine with other products to create a unique card to send to a family member or friend and brighten their day. Cammie created this card by using the Simply Sent card kit, her exclusive Grow stamp from convention and a few other basic supplies to create some thank-you cards to have on hand. To make the card front, fold Simply sent card base in half, add stickers from the accesory sheet, thread button with Bakers twine , knot and adhere to card front. Stamp sentiment. The inside of the card was stamped using the Grow stamp, the Stampin Up color mrkers and the stamp-a-ma-jig for exact placement of the stamped image. Done and oh so cute, creative and super quick. The 3 sisters have made their accessories and more wish list and checked it twice. Here is what we wish for from the new SU 2011-2012 IBC: Idea Book and Catalog http://204.228.150.61/catalogs/20110701/20110701_IBC_en-US.pdf. My accessories wish list includes all the new ribbon starting on page 194. 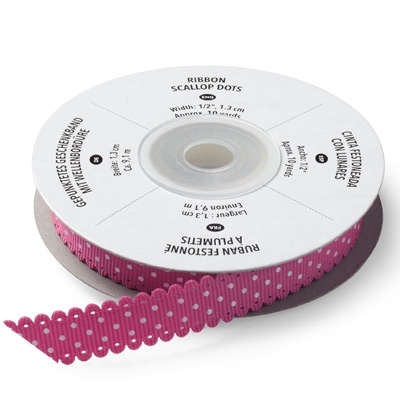 I have always loved StampinUp ribbon but this IBC is over the top with the new offering of 3/8″ ruffled ribbon, all new 3/8″ Denim Jean ribbon, On page 195 the 1/2 ” scalloped dot ribbon and the expanded collection of my all time favorite 1 1/4 ” Striped Grossgrain ribbon. Since Cammie’s first love is fabric her must have accessories are the designer Fabric on page 196. She can not wait to get her hands on the Flirtatious #122335 $9.95 and timeless portrait fabric #122337 $9.95. Cammie also is ecstatic over the Clear Mount Cling Foam on page 205 #124239 $10.95 so she can easily convert her wood mount stamps to clear mount stamps! Blair’s accessory wish list is to begin accumulating Big Shot dies for her recent Bigshot birtday present from her sisters. Blair wants all the embossing folders on page 218 (too many to list). Her top Big shot dies are the new Petite Pocket, pg 221 #123131 $42.95, Candy wrapper die page 221 #120890 $32.95, and the all new Blossom Box, page 221 #123127 $32.95. Take some time to look thru the IBC and leave a comment on your favorite Accessory. In case you have not seen the new SU 2011-2012 IBC: Idea Book and Catalog http://204.228.150.61/catalogs/20110701/20110701_IBC_en-US.pdf. It is full of beautiful designs and lots of new products including stamps, paper, new in color cardstock, embellishments, cool tools, decor elements and more. If you want to have a hard copy of the IBC it sells for $9.95 but can be yours with a $100 purchase. Contact me if you are interested in placing an order. The hostess benefits have changed so check out page 9 for all the new and exciting details. 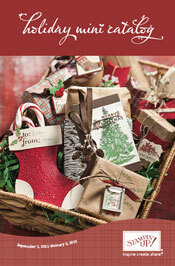 Cammie’s top stamp sets from the IBC are: Season of Friendship pg 102, #111776 $23.95. This is an oldy but goody but a true must have item. Cammie is going for all the big Background stamps (wood mount only) starting on page#149 to include Sunflower #123606 $17.95, Tool Shed pg 151 #123688 $17.95, Hello Doily pg 150 #122845 $17.95 and Good Grid pg 152 #122630. Funny I thought Cammie was going away from wood! And our baby sister, Blair, (wannabe stamper but has no time) wants: Many Mustaches pg 18 #122917 $9.95, SWAK pg 20 #120861 $5.95, Kidoodles pg 58, #122867 $16.95 Under the Big Top (clear) pg 63, #122877 $18.95 and the coordinating Up Up and away (clear) pg 63, #122757 $18.95. Take some time to enjoy the IBC and leave a comment on what your favorite stamp sets are. One BIG advantage of being a SU demonstrator is that you can see new products way before they go live. Here is a little teaser of the new products coming in the upcoming holiday mini that is available to order 1 September. If you leave a comment on my blog by 1 August I will add you to my holiday mini catalog list so you can be ready to see all the goodies inside. As you can tell, MDS has become my go to tool for card making. I love it that I can use my “geeky” side to create a card base and be lazy and print them out in mass thru Stampin Up and have them ready to add the appropriate traditional embellishment for the perfect hybrid. 1. the offspring of two animals or plants of different breeds, varieties, species, or genera, especially as produced through human manipulation for specific genetic characteristics. 2. a person or group of persons produced by the interaction or crossbreeding of two unlike cultures, traditions, etc. 3. anything derived from heterogeneous sources, or composed of elements of different or incongruous kinds: a hybrid of the academic and business worlds. Here is another sample of one of my hybrid designs. 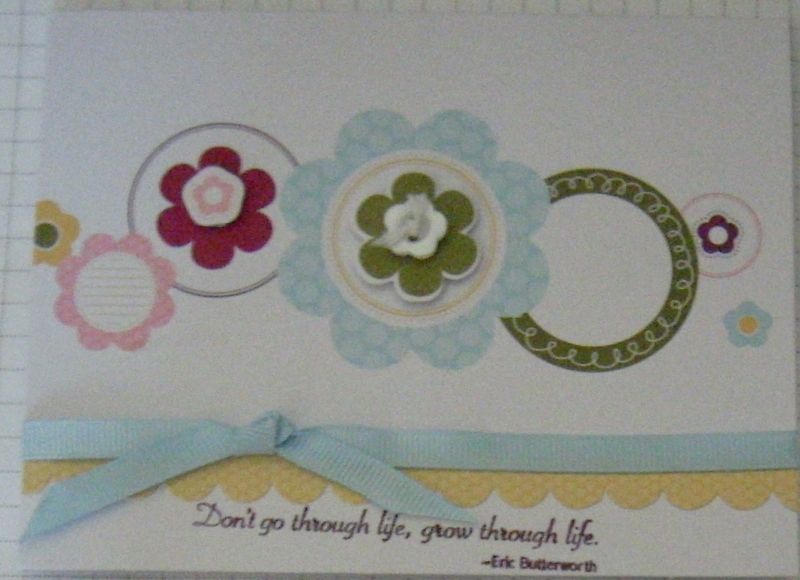 Created the Card in MDS using 1 of the desigher series paper and printed the card through the StampinUp printing service. Card was easy to assemble. Take printed card and fold in half. Cut a strip of whiper white cardstock and attach to card base. 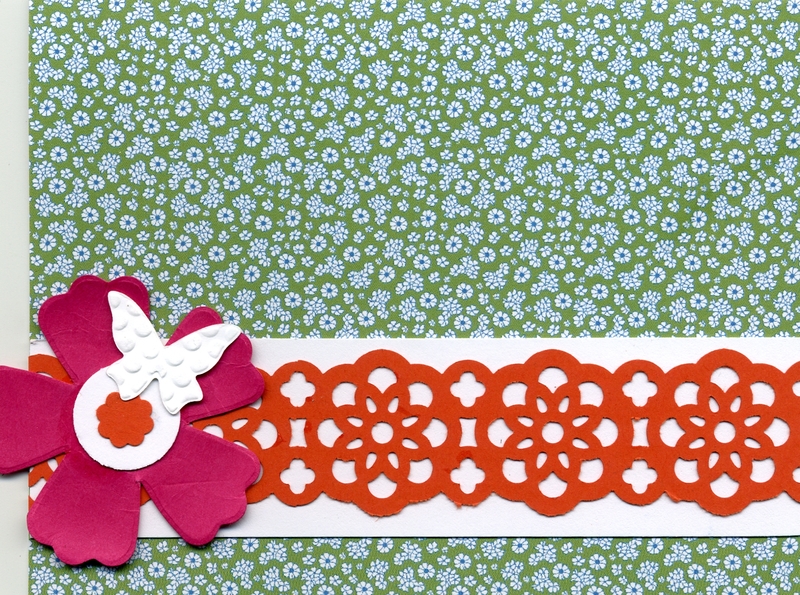 Punch a strip of tangerine tango using the Lace Ribbon Border Punch and glue to white strip. Cut flower from Bigz Fun flower or Island floral die using bigshot and Melon mambo cardstock and glue on top of lace ribbon border Puch a white center using the 1/2 ‘ circle punch and glue to center of mambo flower. Punch itty bitty flower from tangerine tango cardstock and glue to center of white circle. Cut a white butterfly using the bigshot and the Beautiful Wings Embosslit Die and glue to the mambo flower. Wow another easy and beautiful card. Digital scrapbooking and card making is all the rage now and StampinUp offers a product called My Digital Studio,MDS, that includes lots of digital downloads of the designer paper. stamps, and embellishments (both retired and current) that we have grown to love. The software is easy to use and you can create cards, photo albums, calendars and scrapbook pages that you can print through Stampin Up and get a great quality product. So far I have created 2 digital scrapbooks, a desk calendar, and many digital cards to have on hand to embellish up when I need a quick card. Go ahead and embrace the change try My Digital Studio today! If you are interested in purchasing MDS software or the downloads let me know. If you are in the Columbus Ohio area and want to see what MDS is all about I can show you my finished products and a preview of the software. Digital scrapbooking and card making is all the rage now and StampinUp offers a product called My Digital Studio that includes lots of digital downloads of the designer paper. stamps, and embellishments (both retired and current) that we have grown to love. The software is easy to use and you can create cards, photo albums, calendars and scrapbook pages that you can print through Stampin Up and get a great quality product. I love to create hybrid cards by using MDS to design my card fronts and then print the card fronts from StampinUp. When I need a quick card I grab the MDS card and then embellish the card with traditional elements thus creating a beautiful hybrid. 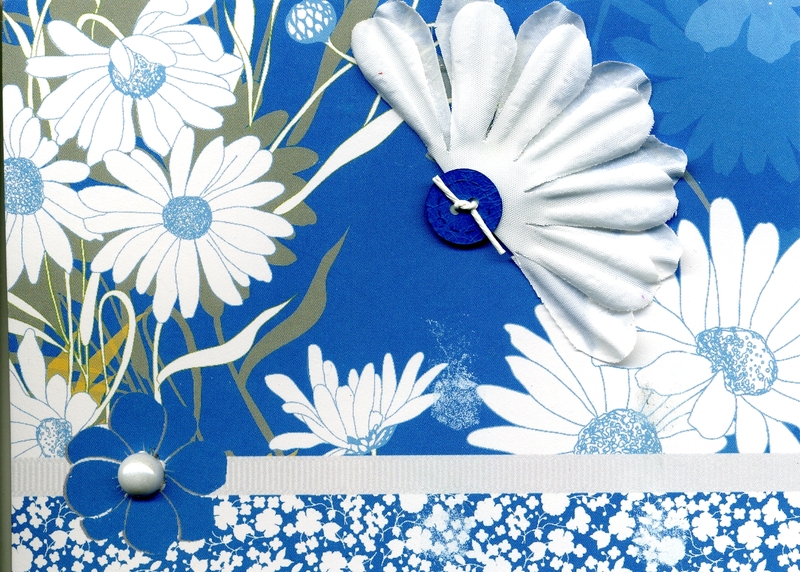 Created the Card in MDS using 2 of the blue patterned paper in the beyond the garden digital download. Added the digital white digital ribbon and the blue flower digital stamped image and printed the card through the StampinUp printing service. Card was easy to assemble. Take printed card and fold in half. Fold paper daisy in half and glue down. Cut paper button with the Sweet Buttons embosslit die and the bigshot in Pacific point add a bakers twine knot and glue in center of paper daisy. Add a pearl to the center of the blue digital flower. Done! What a beautiful card for a special friend to receive.